Hail Varsity staff writers Greg Smith, Jacob Padilla and Derek Peterson offer three final takeaways from the Nebraska's (3-3, 2-1 Big Ten) 38-17 loss to No. 7 Wisconsin (5-0, 2-0 Big Ten) on Saturday night. With a day to process this loss by Nebraska, I still have an overwhelming feeling of the team missing an opportunity. The opportunity to change the narrative around the program and the man leading it. The opportunity to show they belonged in the conversation with teams like the Badgers. The opportunity to show many top flight recruits that Nebraska was making strides in the right direction. Instead, on a night that was tailor-made for them to take advantage of a juiced crowd and the nostalgia of honoring the last title team at Nebraska, they come up woefully short. This one was different than other blowouts that have happened in recent years because instead of a glaring skill or speed difference, there was a stunning lack of physicality from the Huskers that does not hold up to what the place was built on. That doesn’t mean all is lost because we do have to remember Wisconsin is a top-10 team well on its way to playing for the conference title in Indianapolis in December. Nebraska’s retooled offensive line held up its end of the bargain particularly against the pass, not allowing a sack. The defense got bludgeoned but it’s easy to forgot how young they are six games into a new defense. There is good and bad news to having another top-10 opponent next week. Good news is that winning against Ohio State would largely erase Saturday night's debacle. Bad news is, I believe Ohio State is better than Wisconsin. Buckle up for a wild week. Nebraska’s poor injury luck this season, especially in the secondary, continued on Saturday. Just as Joshua Kalu returned from the hamstring injury that knocked him out of the game at Oregon in week two, Nebraska lost the player who had filled in for him in junior Antonio Reed to a knee injury. As a result, Kalu was pressed into full-time duty right away. That wasn’t all, however. Both Kalu and Aaron Williams got banged up at some point during the game, and with Reed out of commission redshirt freshman Marquel Dismuke had to step in. Perhaps part of the reason for the rash of defensive backs getting banged up was how often they were left to make a play. Three of Nebraska’s top four tacklers were safeties — Williams with 11, Kalu with 10 and Dismuke with nine. That means Wisconsin spent far too much time at the second and third levels against the Nebraska defense. To be fair, the safeties missed some of their run fits as well, but Nebraska’s front has been the strength of the defense so far this season and the Badgers won at the line of scrimmage time and time again. Safeties are supposed to be the last line of defense in football and for too often on Saturday, they were the ones making the play. There were plenty of negatives in Nebraska’s 38-17 home loss to Wisconsin, but for the purposes of this, I’ll focus on one of the positives: JD Spielman. The redshirt freshman wide receiver had flashed his all-around playmaking potential before. His first career touch in a Nebraska uniform was a 99-yard kickoff return for touchdown in the opener. He was the Huskers’ leading receiver against Rutgers with 46 yards and a score. But Saturday night, Spielman was on another level. He was targeted a career-high 11 times and hauled in a career-high six catches for a career-high 79 yards. Spielman didn’t see the endzone on the night, but his usage showed how far he’s come in his first season on the field. Five of Spielman’s targets came on third down throws. He caught four of those balls and converted three for first downs – including two that went for 22 yards apiece. Which they are. Spielman isn’t just seeing time in the slot, he’s moving all over the field. In the second quarter with the Huskers in Wisconsin territory, Spielman lined up in the backfield and took a wheel route towards the goalline. Lee floated a pass to him but a Wisconsin defender was there to make the catch a difficult one. Later, Spielman ran a corner route in the endzone but couldn’t haul in a pass from Lee that would have resulted in a score. Riley says those are plays he’s confident Spielman will make as he continues to grow. Lee said they’re plays he wouldn’t have even had the chance to make six weeks ago. 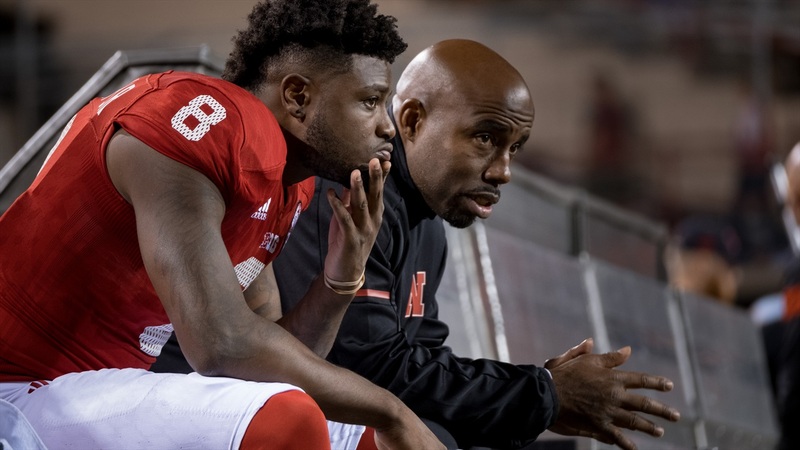 With junior Stanley Morgan Jr. popping off for his third 100-yard game this season, the emergence of Spielman alongside the established senior De’Mornay Pierson-El is proving fruitful in the Nebraska passing game. If Lee has time, which he did Saturday, he has three different options that he trusts can bust games open. Riley is excited about that.